"Well, hello! Come right in! Oh, George! We've got company!" Comedy's first couple were busy hosts. As friends and neighbors of Hollywood's greats, you never knew who'd turn up next for a dose of Gracie's nonsense and a song or two from George. 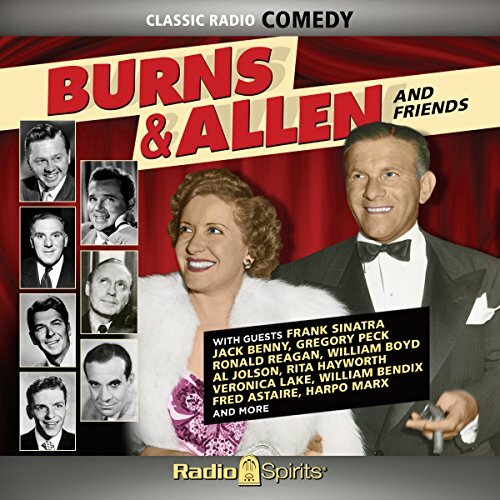 This eight-hour collection of hilarious half-hour visits to the Burns house features a galaxy of famous guests! Rita Hayworth, Frank Sinatra, Veronica Lake, Fred Astaire, Alan Ladd, Jack Benny, Harpo Marx, Gregory Peck, Mickey Rooney, Ronald Reagan, and more stop by to exchange gibes with George, be baffled by Gracie, and delight audiences with their playful side. This show is very entertaining mindless fun. Some of the references involved are a bit old, so young people may not appreciate this as much as older folk, but it is something the whole family can get endless entertainment from. The recordings and sound on this are of good quality, if that is a concern of yours.